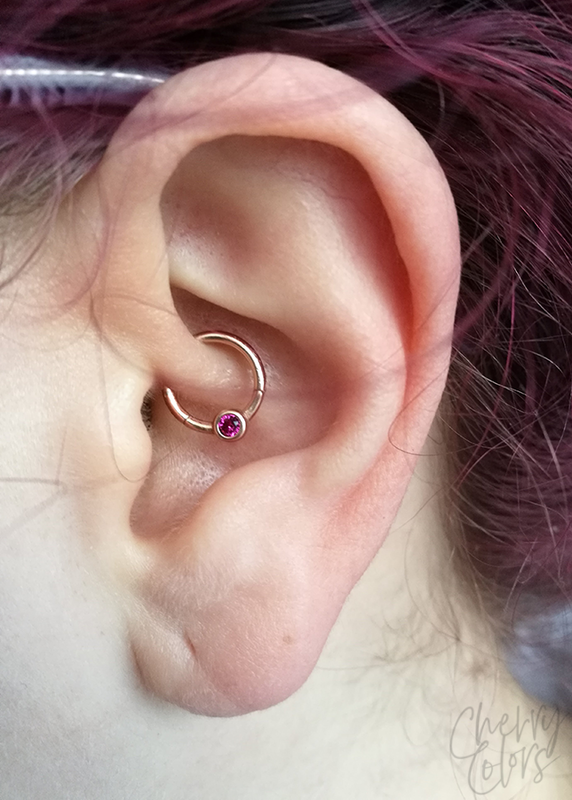 Daith Piercing UPDATE - Cherry Colors - Cosmetics Heaven! 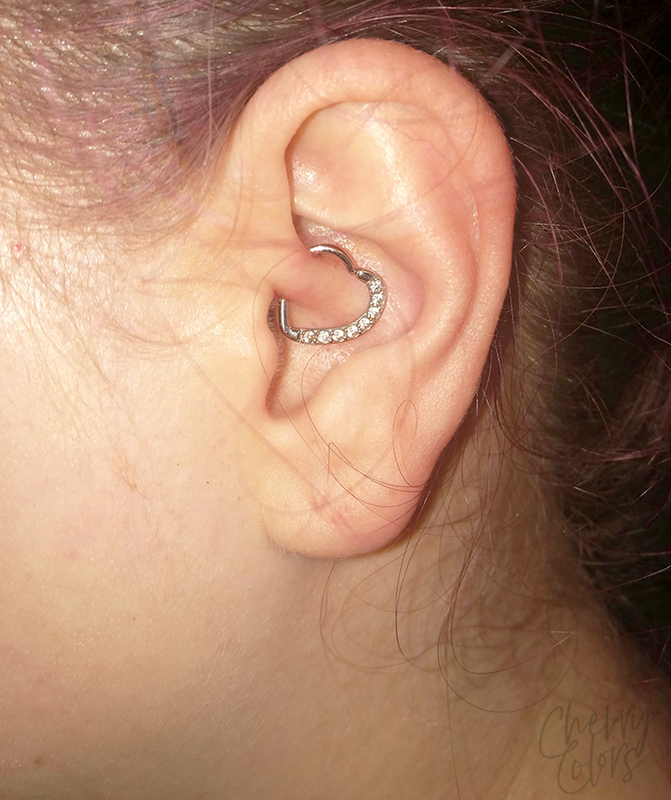 I promised that I'd let you all know how the story with my daith piercing played out. 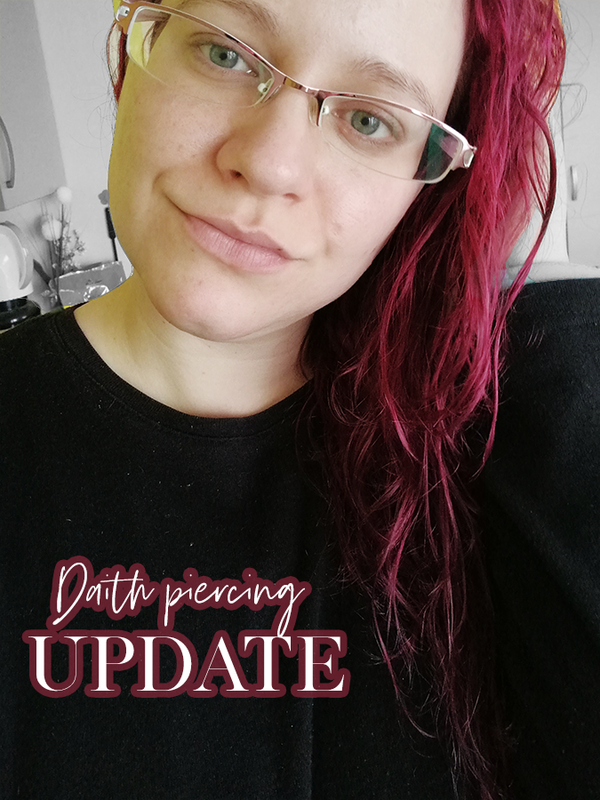 If you are curious and want to see what I wrote about getting the piercing, you can read it here: I GOT A DAITH PIERCING! A Daith piercing, pronounced /ˈdeɪθ/ (rhymes with 'faith') or /ˈdʌθ/ (homophonous with 'doth'), is an ear piercing that passes through the ear's innermost cartilage fold, the crus of the helix. 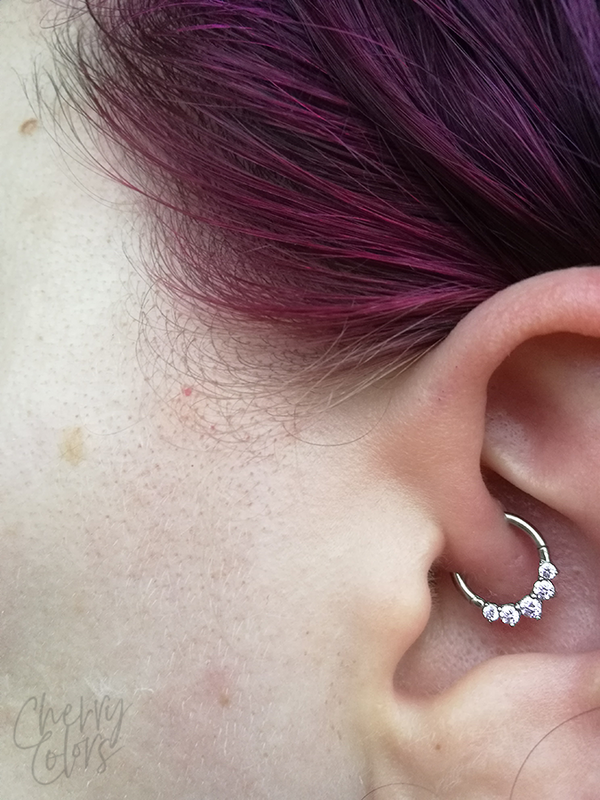 The piercing is located in an awkward, curvy place and is usually pierced with a straight hollow needle. Captive bead rings are the most common jewellery type used. My piercing was made about 8 months ago and I can say it was completely healed by the time it got to month number 4. Me switching rings after a week or two. At first, the balls lost the gems. One gem, then two, then three and then it was just too damn ugly to look at. So I got some new balls from my piercer. But before I got those (she had to order some new ones), I used some old ones. I disliked the way it looked with the new old balls and thus, I decided to try a clicker. You know, clickers are for healed piercings. 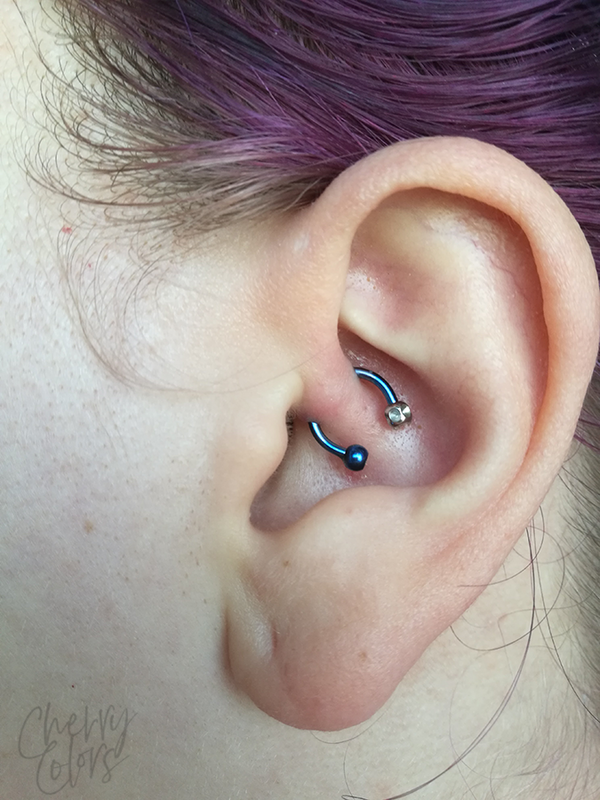 Was my piercing healed? Yeah, it wasn't. But it was completely fuss-free and because of that, I decided that I want it changed. I changed it myself with a help of some tweezers and lots and I mean lots of patience. It was easier than changing my tragus piercing (when I did it for the first time). I picked this very shiny clicker from All Over Piercings. Let me tell you that I love it! I preferred this sort of style (full circle) instead of the horseshoe as it didn't move that much. And when I mean that it didn't move I mean that it didn't spin from one hole to the other, but instead it sometimes swang towards my hairline. If that makes sense? It wasn't annoying or painful so I let it go. After a month or so, I went back to my piercer so she would switch my ring for me. I went for a heart style jewelry because it looked cool in pictures. But you see, this is one of the heavier piercings out there and that means that it constantly moved. From one side to the other, up, down, you name it. Again, it wasn't painful (except the switching of the jewelry which prolonged the healing for another month) but it was annoying. Whenever I wanted to pick something up (or you know, do a workout with weights) it would swing towards my hairline and back. It was driving me crazy. It lasted two months and only because I couldn't get it out myself. I was super irritated with it. That's why when I went to get my tattoo appointment (different dude, but same studio) I asked my piercer to switch the rings for me. Now I have this lovely click ring. And honestly, I don't even know that it's there. Changing the piercing jewelry isn't that hard. But that took me some trial and error to realize. I learned that for me it's the easiest if I put the ring on the lower hole. This way there are fewer errors from my side which means less tearing of the healing hole. I find it easy enough to do. But I do have some clickers from Crazy Factory that I couldn't put in myself. The hinges are 1/2 on the ring and that was problematic for me. But I'm sure I could go to my piercer to do it for me. The piercing didn't feel painful at all. I had a bit of a headache right after it was pierced but after that, none at all. It was a piercing that was super easy to heal as it's out of the way. I slept on it from day two. I think it got a bit angry at me playing with it one day, but that went away after a nice cleaning with some saline solution. It's the easiest piercing I've ever had. I used them since week 2. I found them to be a non-issue. But that may be the way my ears are shaped? I was able to wear them with any of the piercing styles I wore. Even with the bigger ring. I don't know if I've had fewer headaches or migraines since getting it done. I mean, I never kept tabs on those things as they aren't something I get often enough. But in the past 8 months, I've got maybe one migraine and three headaches? I love it! This for me was the easiest piercing to heal. There are lots of amazing piercing styles to try and wear and in the end, it's still very discrete. The piercing part was painful, but the healing was a breeze which for me makes it worth it. Do you have it? What do you think about it?